I have been lucky enough to be invited by Elsevier to talk about copyright the card game as part of one of their Library Connect webinars. 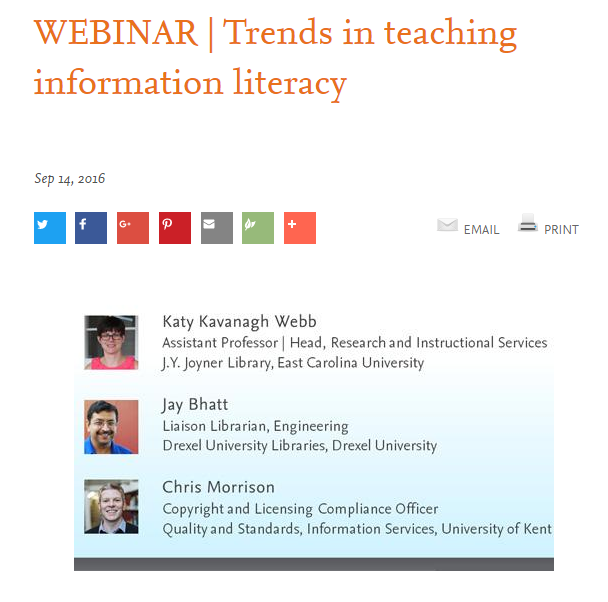 The session is entitled ‘Trends in teaching information literacy’ and I’m presenting alongside Infolit experts Katy Kavanagh Webb from East Carolina University and Jay Bhatt from Drexel University. Katy will be talking about her work on curriculum mapping and Jay has been involved in creating a large scale learning competition which has benefited his engineering students. In my presentation I’ll be sharing the story of how I came to create the card game and talk about playing it both at Kent as well as at external events. At the moment it looks like 1,500 have registered to watch so I’m really looking forward to sharing some of the exciting things going on around copyright at Kent and in the wider UK HE community. The webinar takes place on Thursday 13 October at 4pm BST and you can register for it here.